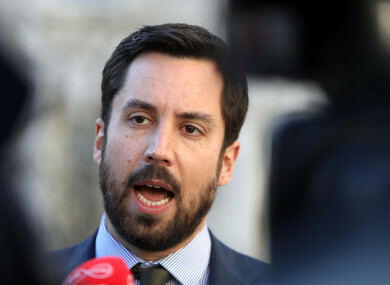 LEGISLATION WHICH WILL see landlords who raise the rent more than the legally allowed limit reprimanded will be brought to Cabinet next Tuesday, Minister for Housing Eoghan Murphy confirmed today. In April, Murphy announced proposed new measures that would form part of the new Residential Tenancies Bill. Speaking at the launch of Threshold’s annual report, Murphy confirmed that the Bill will be brought to Cabinet next Tuesday. Today, Murphy reiterated a number of measures the new Bill will bring in. Among these is a planned law making it an offence for landlords with properties in Rent Pressure Zones (RPZs) to raise the rent above the legally allowed 4%. A detailed analysis of RPZs can be read here. “It’s also going to give the [Residential Tenancies Board] independent powers to examine and enforce any breaches of those rent caps, which I think is necessary,” Murphy told reporters at the event. Currently, a complaint needs to be made by an existing tenant before it can investigate. The Bill will also contain measures to increase the notice periods for tenants facing eviction, to give them a longer time in the property before they have to leave. Furthermore, it will allow for a public register of rents in a certain area, so that tenants will know what they should be paying. “I think it’s very important that, as we build new homes, at the same time we’re also bringing in stronger protections for rents as well,” Murphy said. In April, the minister said a new sanctions regime would make it a criminal offence to breach the rules. He suggested that a number of measures would be rolled out and implemented by the RTB (Residential Tenancies Board), including fines. TheJournal.ie reported in November that the degree to which landlords can be reprimanded under the new laws was still being discussed at government level. When questioned further on the implementation of sanctions, Murphy said he would clarify “what the actual sanctions are for people who are in breach of RPZs in terms of the caps next week” when the legislation is published. “What we know is that RPZs have worked in terms of having a dampening effect on rent inflation, but we know they need to be strengthened because we are hearing reports of landlords who are in breach of them,” Murphy said. In November, a number of politicians hit out at the current rent control laws after the latest Daft.ie quarterly report found that the average monthly rent nationwide is €1,334, which is €304 higher per month than at the Celtic Tiger peak. Email “New laws to punish landlords who raise rents above legal limit to be brought to Cabinet”. Feedback on “New laws to punish landlords who raise rents above legal limit to be brought to Cabinet”.